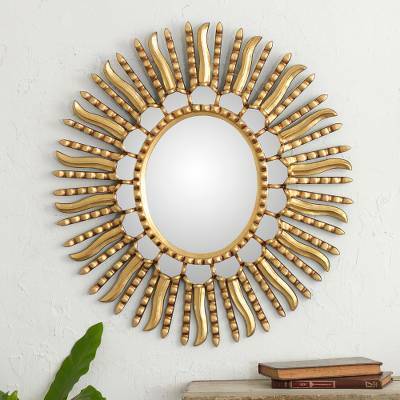 Starburst Bronze Leaf Mirror from Peru, "Winter Sun"
A sun of spectacular beauty radiates golden light in a mirror frame designed by Marcos Luzalde. He crafts the wood frame by hand with lavish detail and adorns it with bronze leaf applications. You can find mirror 'Winter Sun' by Marcos Luzalde in wall decor categories such as Gilded Mirrors, Sun and Moon Mirrors and Wood Mirrors. Enjoy exploring these sections for other Novica treasures. This metal mirror is the perfect accent to my wall!